Happiness is a Cup of Tea! It is not an unknown fact amongst my close friends, that I have a serious love for tea. There is something so wonderfully comforting and refreshing about drinking a warm and cozy cup of your favourite hot beverage, whether it's English Breakfast, Earl Grey or good old Green tea, I can't seem to get enough. Want to know one way to make it taste even more amazing? Serve it from your brand new glass teapot, something which I can't seem to stop doing these days. I absolute adore this little guy, he was a surprise Christmas present and ain't he beautiful?! He certainly makes my raspberry tea look very pretty and is the perfect thing to brighten up the dark and gloomy weather we've been having lately. He's also been my study buddy as I continue to work away on my 4th year dissertation... April can't come fast enough! Do any of you also share my obsession with tea? absolutely share it, i love pukka tea and peppermint :) your tea looks amaze in that pot ! I've never tried raspberry tea, does it taste as good as it looks? I'm thea addicted , i love it !! I collect tea kettles liove tea great pist. so cute! i just read your post and i went straight to make some tea!!! I love tea too! The pics are so sweet :)... Beautiful colours! 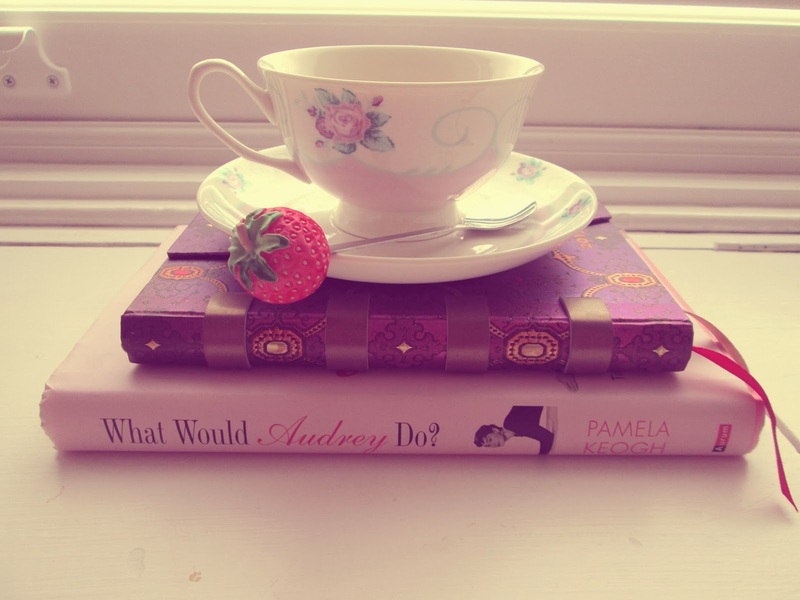 I want to check out that book, 'What Would Audrey do?" I wish there were more varieties of tea here in Peru, so I would drink more tea! That tea pot is adorable! I'm not big on tea, but I am big on coffee. I try not to drink a lot of tea because I know I'll get just as addicted, haha. thanks for your sweet comment on my blog and for following, of course ! Did the same and I'm your newest follower on Bloglovin' ! Loely post about tea .. looks so good I'm going to make myself a cup right now. This post is sooo cute! I love it! I'm seriously getting worried about my obsession with tea! haha just today I came home from school and drank 4 cups without noticing! Tea beats coffee, chocolate milk and any other beverage :D Lovely photos! Wow, I'd drink it just for the colour! Haha!! Looks seriously gorgeous : ) I might have to drop some hints in hopes of a pretty tea set!! thank you so much for your comment, i'm now following you too :) this glass teapot is adorable and with such a gorgeous colour tea it makes sense to be able to admire it! Love a good cup of tea! Such a lovely idea for a present, it looks so pretty! I love tea so much. Drinking out of a pretty teacup makes it taste so much nicer, don't you think! I would have to say my favourite is peppermint! A lovely tea pot makes all the difference. I love herbal teas! Especially those labeled "zingers"--the raspberry zinger by Celestial Seasonings is so good! I definitely share your obsession with tea!- English Breakfast is my fave! I definitely share your obsession with tea! I loveeeeee Earl Grey tea. The Clipper peppermint infusion is also great! Is it possible for tea to look beautiful!? Because this tea definitely does. I just recently started getting into tea, but I'm starting to like it alot. Such pretty tea! And i agree, a good hot cup of tea is where it's at! im totally in love with strawberry tea at the moment! anyway, lovely post, the photos are amazing! Your photos are so beautiful. That teapot is too cute. Tea is soothing and calming. I love a (good) cup of coffee, but if I'm nervy, tired or anxious, a cup of tea is perfect. The old-fashioned routine with a pot, leaves, strainer etc reminds me of my Grandma and her beautiful bone china tea-set. I so agree with the title of this post! Ohmygoodness these pictures are so cute. And that little strawberry spoon. I thought a Valentine's gift for our blogs! Let's check it! What a beautiful and thoughtful gift! Definitely a lovely addition to any kitchen collection. Hot tea is perfect for any winter night at home! Love these photos! Love your tea pot where is it from? I have the same obsession with tea...I have the usual nicknames...teapot, tea leaf, kettle kath etc...haha! That teapot is awesome I'd love one! I'm so obsessed with tea, what a lovely post! Love the pictures! I am totally in love with tea too! My fiancee bought me a glass teapot recently and I just feel so fancy drinking tea from it! Have you come across Kumsi Tea? Love, love tea. Love Teavana. They carry lots of varieties and flavors. I like tea, but i'm definitely a coffee addicted. Tea is good when is too late for coffee :) but this raspberry tea looks really nice, I have to try it. 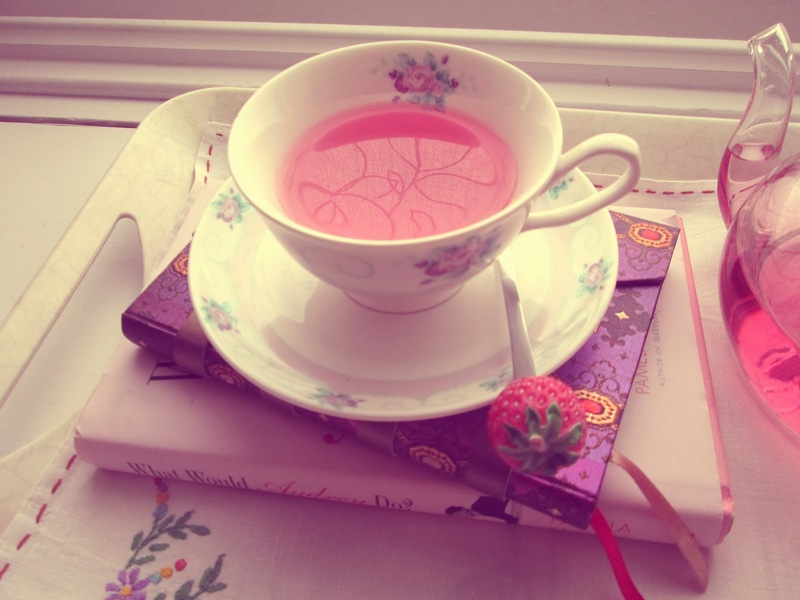 When I saw the picture I thought that it was rose tea, which must be also amazing. The teapot is really beautiful, honestly. Is my first time in your blog and you really convince me to come back in the future. I like your style: simple, young, elegant and a bit rocker. But I like even more your natural way to be on the photos, I really appreciate naturalness. 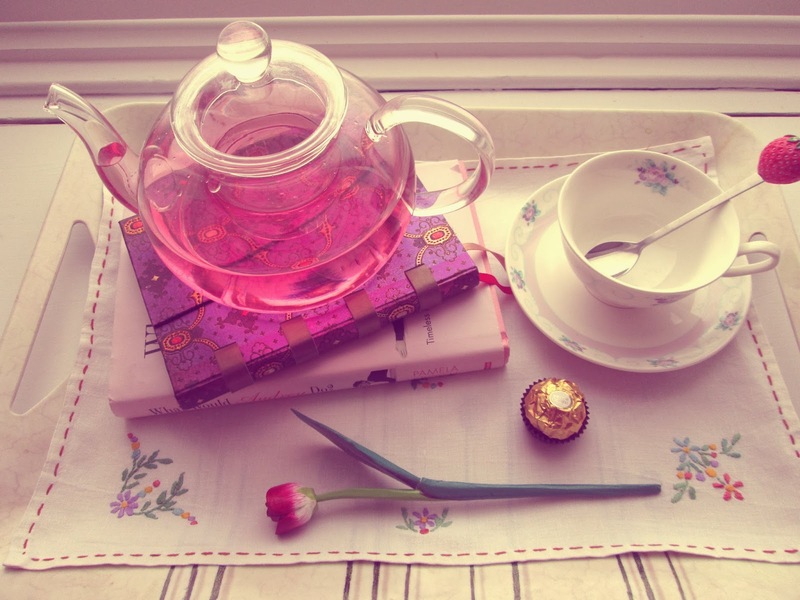 Oh, love your tea set, it's so cute and girly! Yesss! I love tea. Although I am not sure I would enjoy raspberry tea. I am always disappointed how they never taste as yummy as they smell. 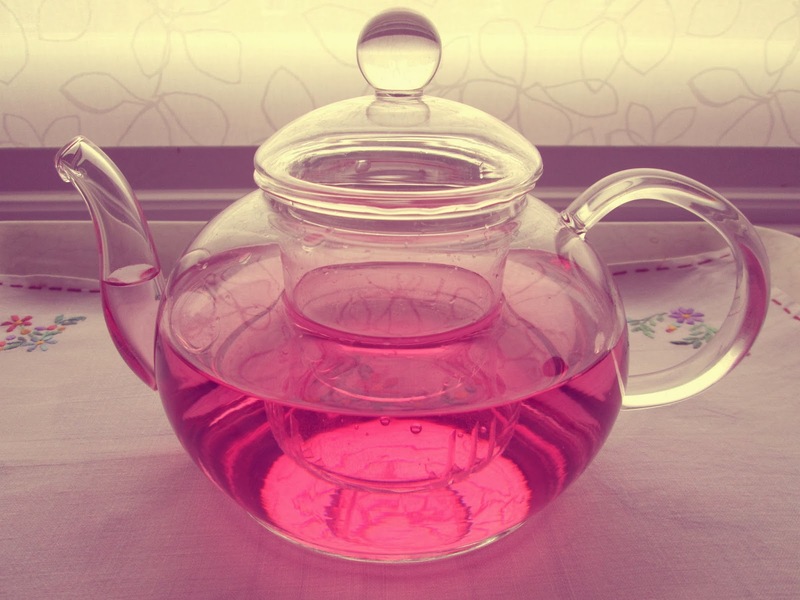 But your beautiful teapot nearly persuades me to start drinking pink tea- it looks absolutely adorable. Your pictures are so cute. that looks so cute! definitely have an obsession with tea as well. I probably drink 2 pots of tea a day - seriously! It's the only way I survive sitting at a desk all day. I love the yogi teas especially, and a good black breakfast tea and Earl Grey. CUTE! What an adorable post ^^. that teapot is super pretty! i used to have a similar obsession but ever since i cut down on milk and sugar, it has not been the same. I learnt to enjoy sugar free herbal tee but it is definitely not an addiction. Your blog is amazing, love it! Love the tea pot and love tea in general! Me! :) I also love tea. My favorite is Twining Cranberry & Raspberry. I have an obsession with frappe and milk tea, I can't survive a week without it. I love the photos, btw. 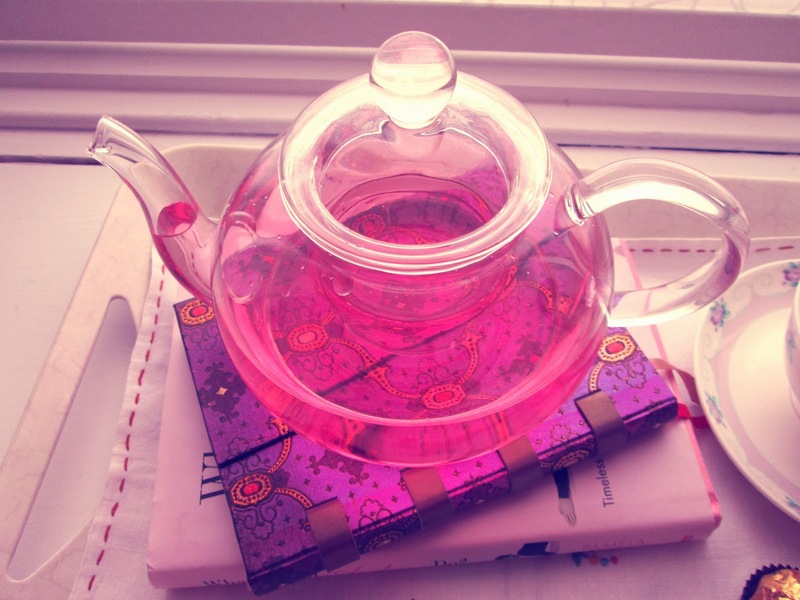 I am absolutely in love with this tea pot, I just need one in my life! Such a great blog..All the tea sets and its designs are just out of world. These Tea sets & accessories are just perfect for a beautiful dining. The tea looks great in that teapot! I also share your obsession, who could not like tea!